Starring Will Smith, Margot Robbie, Rodrigo Santoro, Adrian Martinez, BD Wong and Gerald McRaney. Directed by Glenn Ficarra and John Requa. Ah. The Art of the Con. Cut to 3 years later in Buenos Aires. Nicky is hired by the head of a racing team to sell a less-than-effective engine design that will give him half-second lead per lap. Suspicious of the con artist is his assistant (Gerald McRaney) who is keeping a close eye on Nicky. Thrown into the mix yet again is Jess who made her way to the track and is considered a “race skank.” Nicky tries to make amends with Jess while scheming against the team he’s selling the “defective” design to while dancing around McRaney and the guy who hired him. However, is it all just a con within a con? There are things the movie does well and points where you feel someone interjected or just lost sight of the original idea entirely. What works for the film is Nicky detailing how the con is mastered in such a fluid fashion that it’s like watching a magic trick unfold before your eyes. He’s able to spit out psychological/sociological perspectives on nuance and mannerisms that makes you wonder if there’s a college course on this stuff (probably). Robbie proves that she can be smart and beautiful, transcending the source material in a way that almost begs for a spin-off starring her alone. They do work well together. The letdown of the film is that it feels that the traits of the characters were ditched to rush into a rom-com to make a quick buck. After the setups and the tryout and the championship it becomes Will Smith emoting for an hour and trying to get Robbie back. There’s almost no scene in which Smith is crying, even when he’s supposedly happy being with Robbie. What?!? Did he feel like he was selling his soul to do this film? Does he have a soul left after “After Earth?” And there’s a Gerald McRaney reveal/plot twist that makes you scratch your head as to “Why?” but you’ll find that out should you choose to check it out. 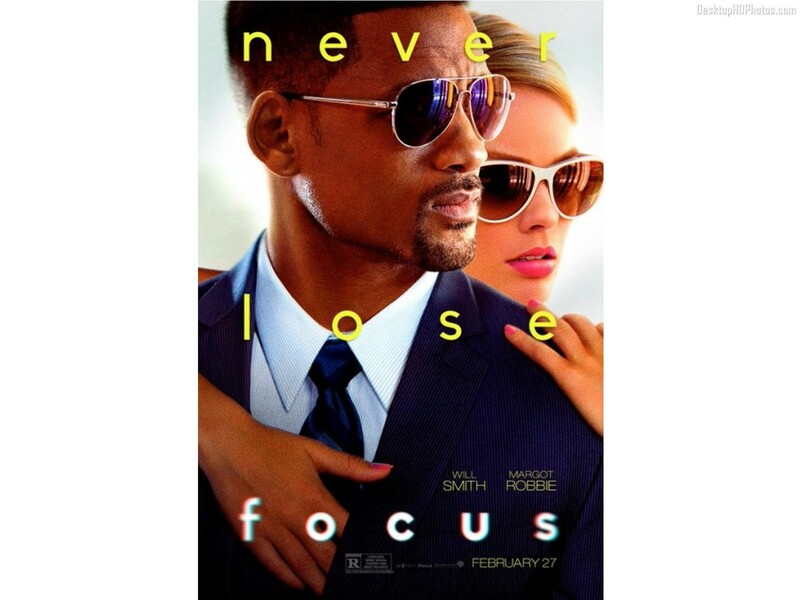 In the end “Focus” is no better nor worse than most other movies. Robbie doesn’t disappoint but Smith does a little. It’s a rainy-day, “nothin’ better on cable”-type movie. For those interested in the male/female con dynamic I suggest the aforementioned “Duplicity” or “Thomas Crowne Affair” remake (or maybe even the original). For those just wanting a different con movie I also suggest “9 Queens,” a foreign film involving a con over some misprinted stamps. Kunis: I don’t know why I’m here. Abrasax family member: You have the exact genetic sequence of our dead mother! Kunis: What does this mean? Abrasax family member: You control the fate of the Earth. Kunis: I don’t trust you. Abrasax family member: But you should! Kunis: Okay, I guess I can trust you now. What do I have to do? Jupiter meets all three members of the Abrasax family who have divied the galaxy into Monopoly properties (“You have ten planets but Earth is worth more than those combined.”) Earth is the Boardwalk of the universe (“Do not pass Jupiter, do no collect…”) and the Abrasax family have one goal in mind: longevity. Immortality being ludicrous the family “harvest” one-hundred humans to make one core sample of a blue substance that they use in order to be younger, healthier, more beautiful, etc. Never mind the fact they already have giant blue pyramids of these core samples or the fact they live for millenniums – one can ever have too much time, I guess. Jupiter (and us, the audience) gain this information watching her go through a story with more convoluted twists and turns than a Mike Hammer novel. 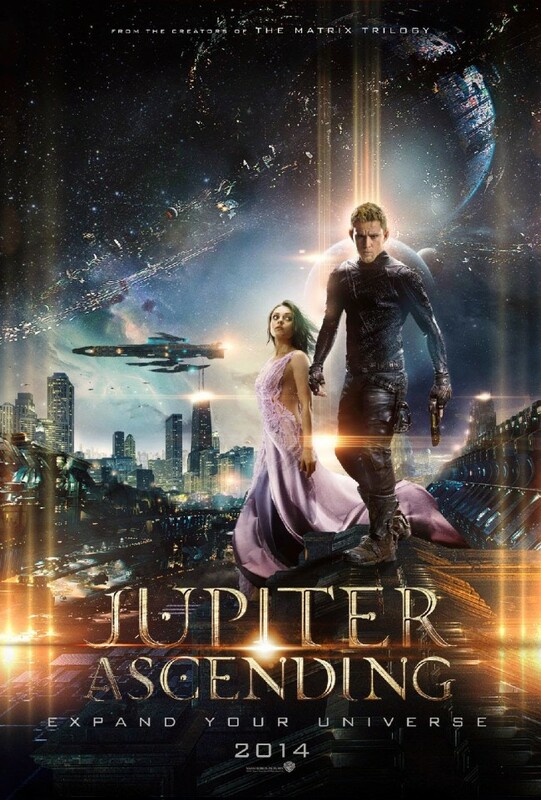 With the help of Caine and Stigler (Bean) Jupiter just may make it out alive and maybe make sense of it all. Maybe. Of note for those looking for inside jokes or gags there are a few to be had. In one scene Tatum, using his anti-gravity boots), grabs the back of a truck and hitches a ride a la “Back to the Future.” When Jupiter goes to prove she is the genetic descendant of the dead Abrasax mother she goes through multiple lines and always has the incorrect form much like “Hitchhiker’s Guide to the Galaxy” or even “Brazil” (note: Terry Gilliam has a cameo appearance in the film). Et cetera. Should you watch this one? If you have a 50-inch or bigger TV check it out; you can even invite me over. This is a film MADE for a movie theater and such the detail is in the set pieces. If you’re less concerned about the CG then you may want to skip it altogether.